Yesterday afternoon we went to the 9th arrondissement to see the neighborhood where George Sand lived, Nouvelle Athènes. Her granddaughter left the author's collection of memorabilia to the City of Paris, for use in the Musée Carnavolet (history of Paris museum). But the city of Paris was also fortunate to be given the Scheffer-Renan house in George's old neighborhood. This was a home that George visited frequently. The painter Ary Scheffer lived there. Among Ary's friends were Sand, Chopin, Liszt, and many other artists and writers. Ary was also fortunate to be friends with the royal family -- always a handy relationship for a portrait painter. 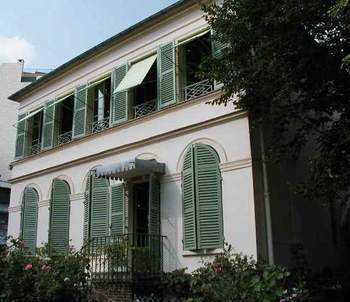 Ary's daughter married the philosopher Ernest Renan, and the home remained in the Scheffer-Renan family until 1980, when it was given to the city of Paris. 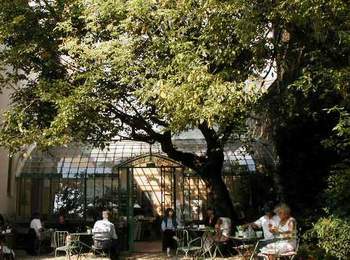 By 1987, Paris opened it as the Musée de la Vie Romantique, one of three city museums dedicated to literature. They rightly chose to put the George Sand collection there. The house is amazingly comfortable and realistic. It still has the feeling of being set in the countryside. 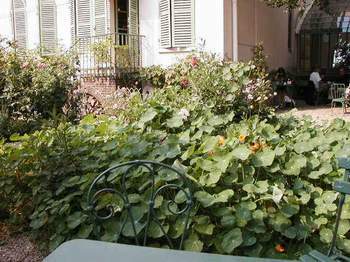 You enter it by first going through a tree-lined narrow lane off of rue Chaptal. In front of the house and to one side is a courtyard and garden, and there are a couple extra buildings in addition to the home. One is a studio and reception room the Scheffer built for himself, with a large, high north-facing window. There is a Bosendorf grand piano in this wonderful space. The house reminded us of Giverny, Monet's country home. It has been lovingly restored, and it isn't the least bit pretentious. The conservatory now houses a tea room, and we took advantage after seeing the museum so that we could re-hydrate and enjoy the garden for a while on this fine, warm summer day. Later we walked around in the neighborhood, and we saw the Square D'Orléans, where George Sand lived at no. 5 and her friend/lover Chopin lived at no. 8. Unfortunately, the Square has been turned into mostly offices, and what must have been some lovely English style gardens in the middle is now all paved for parking. But a pretty fountain remains -- it is currently being restored.